Both contractors and designers felt that that Ecological sustainability had improved significantly. 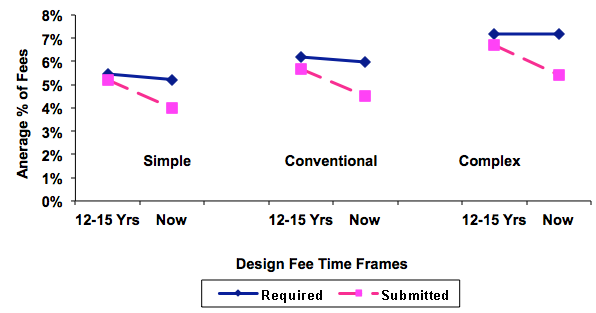 To examine changes in design fee levels, designers were asked to indicate the project fee percentage required to provide a proper service, produce quality design and documentation and make a reasonable profit for projects of differing sizes/price ranges and complexity over the specified time periods. Comparing the difference between the fee levels submitted now to the fee levels required now, responses revealed that the disparity between the 2 fee levels represented an average decline in real designer fee income of approximately 24% for all 3 project complexity levels. It appears that the levels of fees being obtained are well below those required to provide quality design and documentation services. CSIRO is the Australian Commonwealth Scientific and Industrial Research Organization.